QuickBooks 2016 offers some new features that we are excited to share with our fellow accounting professionals. Batch Delete/Void Transactions and enhanced Statement Writer Support are two of the latest features available to Accountants only. Sorting on Item Custom Fields and Auto Copy Ship to Addresses are features only available in Premier (including Accountant) and Enterprise versions of the software. We are cautiously excited about this new feature as it could prove to be quite dangerous in the wrong hands. Fortunately, Intuit realized that and only made the tool available in the Accountant and Enterprise versions of the software and in the Accountant Toolbox in the Pro and Premier versions. It works for Invoices, Bill and Check transactions, but not for Credit Cards Charges or Deposits, at this time. 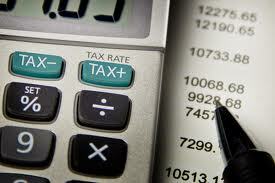 It is also not available for Payroll or Sales Tax Transactions. The columns can be sorted by Entered Date, Modified Date or Transaction Date as well as by Payee, Type, Number, Account or Amount. Any other transactions that are linked to the transaction to be voided/deleted are highlighted for you to be aware and to address them as well, if need be. For example, voiding a Bill-Check does not void the related Bill. I am hopeful that Intuit will improve this feature and add the ability to work with Credit Card Charges, as I have seen many occasions where these were imported to the wrong account or even twice to the same account. As with any tool of this nature, we recommend a backup before and to Void instead of Delete. I do not prepare financial statements, but for those who do and for those who use the QuickBooks Statement Writer, it is essential to have the integration with Microsoft Word and Excel. With QuickBooks 2016, we have this integration with the Accountant and Enterprise versions of the software. However, we still do not have support for the cloud-based Microsoft Office 365. In prior versions, we had the ability to sort on the Customer and Vendor Custom Fields, but not on the Items Custom Fields – those fields were mostly notational and not very reportable. In QuickBooks 2016 Premier, Accountant, and Enterprise, Intuit introduced this feature which will allow sorting on Inventory Valuation and Inventory Stock Status reports as well as the Inventory Price List. This will save countless hours of exporting to Excel and creating Pivot Tables to gather the required information. 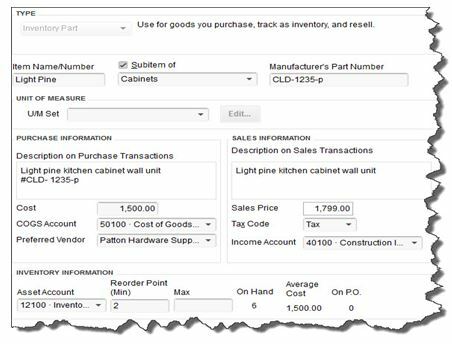 For Contractors and Retailers who order materials or goods to be shipped directly to the job site or customer, QuickBooks 2016 – Premier, Accountant and Enterprise, has the ability to populate the Customer address in the Ship To Address directly from an Estimate or Sales Order, simply by selecting the Drop Ship to Customer checkbox when creating a Purchase Order. We are pleased to announce that on November 18th, 2015, Rhonda Rosand, CPA/Owner of New Business Directions, will be conducting the QuickBooks 2016 Expanded workshop sponsored by the New Hampshire Society of Accountants at the Executive Court in Manchester, NH. Rhonda will touch on What’s New in QuickBooks 2016, how to fully utilize QuickBooks, which software program works best for you and your clients, and an accountants only section leaving plenty of time for questions. 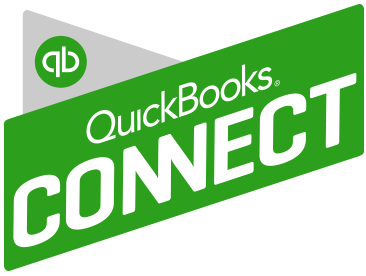 On November 2nd– 4th, Intuit will be hosting the 2nd annual QuickBooks Connect Conference in San Jose. The conference brings together thousands of entrepreneurs, small business owners, accounting professionals and developers under one roof. The mission is to connect, learn and grow throughout a dynamic agenda of main stage and intimate sessions. 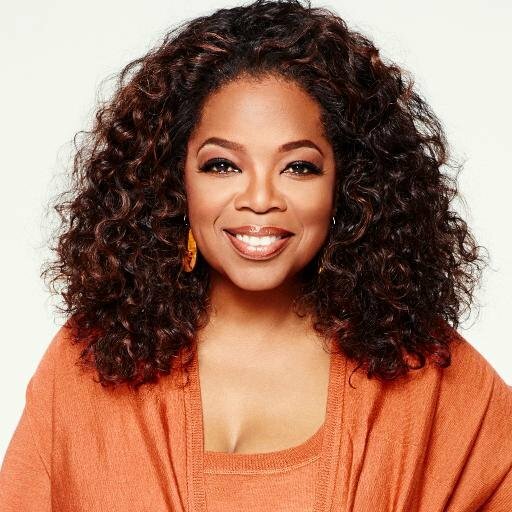 Key speakers include Oprah Winfrey, Jessica Alba, Brian Lee and Robert Herjavec. Sessions topics include: Here to There: The Accountant’s Journey toward Professional Greatness, Work/Life Harmony, 10 Barriers to Service Excellence and How to Overcome Them, and Cash is King: Tips to Increase Your Cash Flow Today. There will also be speed mentoring sessions and an entire series of QuickBooks Online training topics. If payroll expenses are one of the higher costs in your business, then it makes sense to boost your team’s productivity and maybe also your own. Fall is back-to-school time anyway, so it’s a natural time of the year to take on a course, read a business book, or hire an organizer to help you get more from your workspace. If you spend a lot of time doing email, consider taking a course on Microsoft Outlook® or even Windows; learning a few new keystrokes could save you tons of time. If you need more time, look for a book or course on time management. Look for classes at your local community college or adult education center. Do you have inventory in your business? 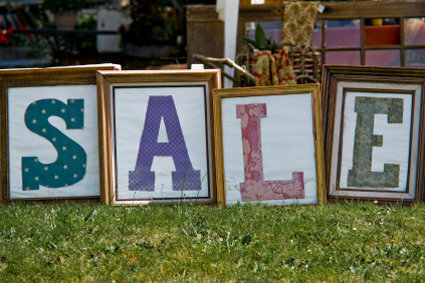 If so, take a look at which items are slower-moving and clear them out in a big sale. We can help you figure out what’s moving slowly, and you might even save on taxes too. Take a checkpoint to see how your revenue and income are running compared to last year at this time. 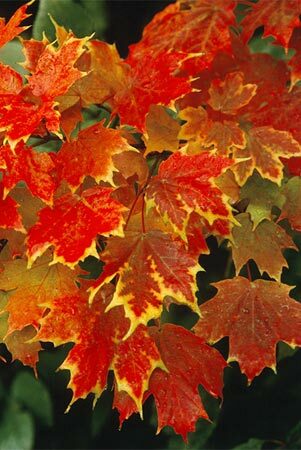 Is it time for a celebration, or is it time to hunker down and bring in some more sales before winter? With one more quarter to go, you have time to make any strategy corrections you need to at this time. Let us know if we can pull a report that shows your year-on-year financial comparison. Avoid the time pressure of year’s end by getting ready early. Review your balance sheet to make sure your account balances are correct for all transactions entered to date. You will be ahead of the game by getting the bulk of the year reviewed and out of the way early. Also make sure you have the required documentation you need from vendors and customers. One example is contract labor that you will need to issue a 1099 for; make sure you have a W-9 on file for them. If we can help you get ready for year-end, let us know. If your business has multiple products and services, there may be some that are far more profitable than others. Breaking these numbers out to calculate your profit margins or contribution margins by product or service line can help you see the areas that are adding the most income to your bottom line. Correspondingly, you can determine if you have any items that are losing money; knowing will help you take the right action in your business. Refresh your financials this fall with your favorite idea of these five, or come up with your own fall project to rejuvenate your business. Many Retail stores sell inventory on consignment. It’s important to keep track and to know how much inventory you have in stock, who it belongs to and where it’s all located. Let’s start our discussion of Accounting for Consignments in QuickBooks with a few basic definitions. Consignment – the act of consigning, which is placing any materials in the hands of another. Consigned Inventory – the goods shipped by the Consignor to the Consignee. Consignor – the owner of the inventory – the person who hands over the goods to be sold. Consignee – the seller of someone else’s goods – the person who receives the goods to sell. There are two sides to the consignment equation – Consignor and Consignee. In this article, we will discuss the situation from the viewpoint of the Consignor. Note: We will also assume that you are using QuickBooks Premier and not Pro or Enterprise. As the Consignor, you own the inventory – it’s your asset and your responsibility and if the product is damaged, it’s your loss. You are the party at risk and have an insurable asset. You’ve consigned it, or handed it over, to someone else who has agreed to sell it on your behalf in exchange for a pre-determined fee or percentage as well as reimbursable out-of-pocket expenses. 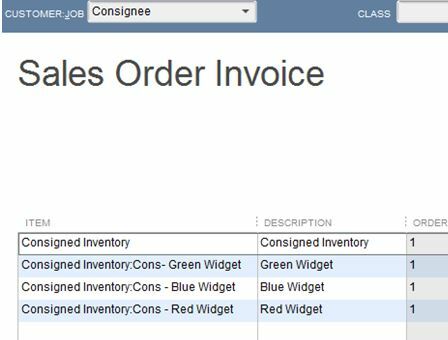 In QuickBooks, it’s as simple as creating a separate section in your Item List for Consigned Inventory and listing each Item as a Sub-Item with an identifier (Cons) that categorizes it as consigned. These are still Inventory Parts and are mapped to the same Cost of Goods Sold, Income and Inventory accounts as your other Inventory Items. Note: You may wish to create a separate Inventory Asset account for your Consigned Inventory, however this is optional. To transfer the Items from your Regular Inventory to Consigned Inventory, it’s an Inventory Adjustment for Quantity only – the value of your inventory does not change, only the location of the Items for sale. Adjust Inventory/Quantity On Hand is located under the Vendor Menu. 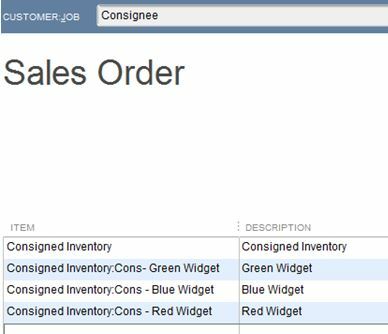 In addition to creating an Inventory Adjustment, you will need to create a Sales Order to the Consignee for the Consigned Inventory. Create Sales Order is located under the Customer Menu. 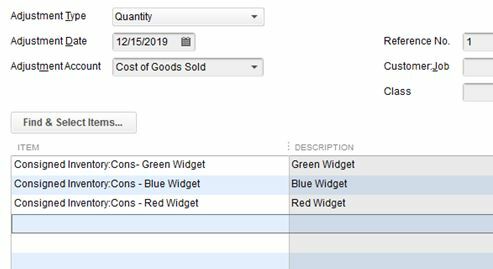 This is a non-posting entry in QuickBooks and will show the Inventory as committed to the Consignee and not available for sale to others on an Inventory Stock Status Report. As you receive reports of Sales of your Consigned Inventory from the Consignee, or better yet, as you conduct a physical inventory of your Consigned goods at the Retail location, you will create an Invoice in QuickBooks from the Sales Order to the Consignee to bill for your pre-determined percentage of the sale, less reimbursable expenses. These are the steps to account for Consignments from the perspective of the Consignor. There are many more steps involved in accounting for Consignments from the angle of the Consignee. We’ll cover these in a later edition of our newsletter – stay tuned. As always, if you have any questions on any of the procedures for recording Consignments in QuickBooks, please contact us. We’re happy to help. Accurate, thorough item records inform your customers and help you track inventory levels correctly. Help you make smart decisions about reordering. You’ll start this process by making sure that your QuickBooks file is set up to track inventory. Open the Edit menu and select Preferences, then Items & Inventory. Click the Company Preferences tab and click in the box in front of Inventory and purchase orders are activated if there isn’t a check in the box already. Here, too, you can ask that QuickBooks warn you when there isn’t enough inventory to sell. Click OK when you’re finished. Figure 1: You need to be sure that QuickBooks knows you’ll be tracking inventory before you start making sales. 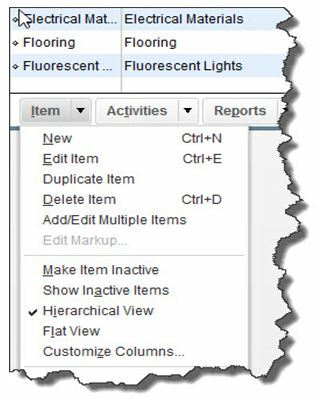 To create your first item, open the Lists menu and select Item List. Click the down arrow next to Item in the lower left corner of the window that opens and select New. The New Item window opens. Warning: You must be very precise when you’re creating item records in order to avoid confusing your customers and creating problems with your accounting down the road. Please call us if you want us to walk you through the first few items. QuickBooks should display the list of options below TYPE. Since you’re going to be tracking inventory that you buy and sell, select Inventory Part. Enter a name and/or item number in the next field. This is not the text that will appear on transactions; it’s simply for you to be able to recognize each item in your own bookkeeping. Figure 2: Let us work with you if you have any doubts about the data that needs to be entered in the New Item window. It must be 100 percent accurate. In the example above, the box next to Subitem of has a check mark in it because “Light Pine” is only one of the cabinet types you sell (you can check this box and select <Add New> if you want to create a new “parent” item on the fly). Leave the next field blank if your item doesn’t have a Part Number, and disregard UNIT OF MEASURE unless you’re using QuickBooks Premier or above. Fill in the PURCHASE INFORMATION and SALES INFORMATION fields (or select from the lists of options). Keep in mind that the descriptive text you enter here will appear on transaction forms, though customers will never see what you’ve actually paid for items, of course (your Cost, as opposed to the Sales Price). QuickBooks should have automatically selected the COGS Account (Cost of Goods Sold), but you’ll need to specify an Income Account. Please ask us if you’re not sure, as this is a critical designation. The Preferred Vendor and Tax Code fields will display lists if you’ve already set these up. QuickBooks should have pre-selected your Asset Account. If you want to be alerted when your inventory level for this item has fallen to a specific number (Min) so you can reorder up to the point you specify in the Max field, enter those numbers there (the Inventory to Reorder option must be turned on in Edit | Preferences | Reminders). If you already have this item in stock, enter the number under On Hand. 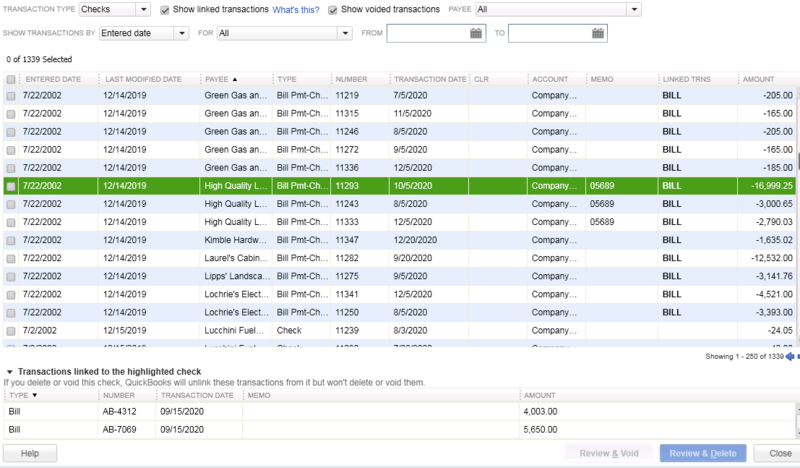 QuickBooks will automatically calculate Average Cost and On P.O. (Purchase Order). Click OK when you’ve completed all of the fields. This item will now appear in your Item List, and will be available to use in transactions. When you want to create, edit, delete, etc. any of your items, simply open the same menu you opened in the first step here (Lists | Item List | Item). Figure 3: The Item menu, found in the lower left corner of the Item List. Precisely created Inventory Part records are critical to accurate sales and purchase transactions. So use exceptional care in building them.